Be the first to share your favorite memory, photo or story of Deacon Guffie. This memorial page is dedicated for family, friends and future generations to celebrate the life of their loved one. Imagine, if you will, a man that stood 6'3" - 225 lbs., able to run 10 miles with ease, and could bench press more than 400 lbs. Imagine being able to say to the other kids "My dad is bigger and stronger than your dad” and know that it was true. A gentle giant, always lovingly sacrificing for his family, doing whatever it took to ensure his wife and children were cared for. Who was this man, a prolific story teller with a voice so powerful that people sat up and paid attention as soon as he began to speak? It was our father, Guffie Eugene Menogan, in so many ways the strongest man we will ever know. Guffie was born on December 21, 1929, while his parents, Guffie Andrew and Pansy Juanita Menogan, were visiting family in Fort Worth, Texas. His mother, Pansy, would write in her diary, of his birth, that she received her Christmas gift early that year. Shortly thereafter his parents returned to Colorado and raised him in the Five Points Neighborhood of Denver. He was educated in the Denver Public Schools and graduated from East High School in 1948. Upon graduation, Guffie received a $100 per semester football scholarship to attend the Colorado School of Mines where it was reported that he was the first African American to attend that institution. Due to a variety of circumstances, including being unable to live in the city of Golden because of his race, Guffie left the School of Mines in 1950 after completing his sophomore year. On November 14, 1953, Guffie married Alleyene Estelle McLuster, a woman whom he cherished and revered until her passing on November 10, 2006. Guffie referred to Alleyene as “the song in my heart” and spoke of her daily. To their wonderfully blessed union of nearly 53 years were born six children: Annita M. Menogan (David Greene) of Denver, Rossana E. (Lenwood) Robinson of Denver, Kelle E. (Rene) Menogan of Madison, MS, Robbyn K. (Bernard) Celestin of Aurora, Sean A. Menogan of Denver, and Ian J. Menogan of Denver. Guffie was also the proud and loving grandfather of 13 grandchildren and 11 great-grandchildren, devoted brother-in-law of Alleyene’s brothers and sisters and their spouses, loving uncle of a host of nieces and nephews, and loyal, steadfast friend and counselor to many including their Marriage Enrichment Group. Guffie was preceded in death by his parents, his wife Alleyene, and his brother, Emmett B. Reed. Guffie joined the United States Postal Service in 1955 and was employed there until 1968 when he left and went to work for the Great West Life Assurance Company and was their first African American salesmen. While at Great West Life he won numerous awards and was a member of their Million Dollar Round Table. Guffie left Great West Life and rejoined the Postal Service in 1972 and he retired as the Superintendent of Mail at the Denver Bulk Mail Center in 1984. He enjoyed his time at the postal service and until recently could still recite the zip codes for most of the cities in Colorado and the major postal regions across the country. In November 1982, Guffie suffered a massive, debilitating stroke, one that the doctor said was so severe that he told Guffie’s wife, Alleyene “he would not survive the night”. Guffie lost his ability to speak and all movement on the left side. However, by the grace of God, Guffie survived the night. He eventually recovered by using the same determination and aggressiveness that he used as a body builder, college athlete and later as a runner. He attacked his physical therapy, often exhausting himself as well as the physical therapist and he regained his ability to walk and move on his own. Guffie’s ability to speak also returned to him as he read the Bible from the Book of Genesis to the Book of Revelations out loud while repeating names and verses until he was able to say them clearly and accurately. The knowledge of the Bible that Guffie obtained through his tireless studies led to his next chapter in life. Interested in his faith, Guffie went to Biblical School and graduated in 1989. 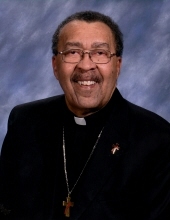 He went on to develop a Bible Study Program, conduct various workshops for the Denver Council of Black Catholics and facilitate panel discussions for the Mile Hi Conference, to name a few. Not satisfied with the many initiatives he had already accomplished for God’s people, he became interested in the Diaconate Formation Program in the Archdiocese of Denver. On June 8th, 1996, Guffie was ordained a Deacon at the Basilica Cathedral of the Immaculate Conception by Archbishop Francis Stafford. Upon his ordination he was immediately assigned to St. Ignatius of Loyola Catholic Church where he remained throughout his ministry until he retired from active ministry in 2008. Always willing to share the Gospel, in 2013, Guffie moved into Brookdale Senior Living Community where he enjoyed working out with a trainer, telling stories to his neighbors, and often led Bible Studies with other residents. Guffie is loved and cherished by his family and friends who will miss his deep voice, his hearty laugh, his appetite for candy bars, his strong handshake, his bear hugs, his fan hood of the Denver Broncos and his devoted love and honor of our Lord and Savior Jesus Christ. But what will be missed most is the bigger- than-life man who constantly demonstrated his never wavering and unconditional love for his family, and an uncanny strength to celebrate the joys and triumphs of life – and to persevere through its trials and tribulations- and through it all he always gave God the glory. To send flowers or a remembrance gift to the family of Deacon Guffie E. Menogan, please visit our Tribute Store. "Email Address" would like to share the life celebration of Deacon Guffie E. Menogan. Click on the "link" to go to share a favorite memory or leave a condolence message for the family.